Chinese Internet giant Baidu is keeping the news flowing at its annual Baidu World Forum event and, fresh from unveiling its Baidu Explorer browser for Android, the search giant has revealed plans to invest $1.6 billion (10 billion yuan) to develop a new cloud computing center to further its focus on mobile. Speaking at the event, Baidu CEO Robin Li proclaimed that we are now in an era of cloud computing, and Baidu is placing great emphasis on a cloud-based strategy to mirror its Web dominance and gain a strong presence on smartphone devices. The move, announced by CFO Jennifer Li in a breakout session, as Reuters reports, is the company’s next step in its cloud-based ‘Box Computing’ strategy which has already seen it release an Android-based operating system. ‘Baidu Cloud’, that mobile OS, provides users with access to a range of Baidu services, and the upcoming cloud computing center is set to provide further backbone for that system. Update: Baidu already operates China’s largest cloud service and a spokesperson confirmed to TNW that the new facility will be built in an undisclosed city in the north of the country. The company has already broken ground on the site, the Baidu representative confirmed, but no estimate for completion of the work or the center’s opening have been disclosed. Baidu is also looking to stir up interest in its cloud services with a promotion offering users 100GB of personal storage that was announced at the event today. Already Baidu partners have released three Cloud-based devices, following the arrival of a TCL-made phone last week, and the company has spent time developing products like Wangpan, its take on Google Drive, to provide dedicated services to Chinese Internet and mobile users. With Cloud, Baidu is hoping it will convince smartphone makers targeting China that its fully localized (and Chinese) interface and services offer the best platform to build devices that appeal to Chinese consumers. If the operating system can gain popularity among phone makers, so it figures, it will grab market share on mobile and begin to replicate Baidu’s dominance on mobile devices/services. Baidu, which already operates the largest cloud in China, has been focusing on developing its mobile strategy with the cloud focus, and it is also looking to international growth to further spread its wings. 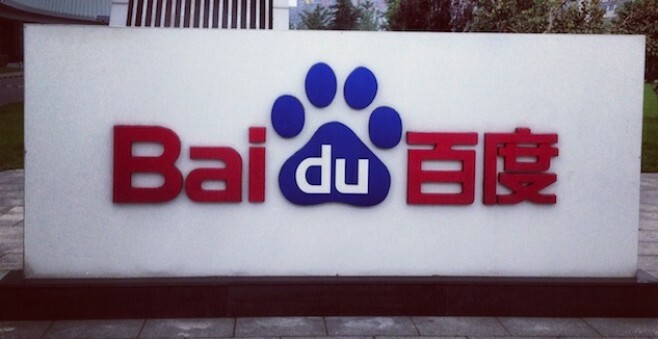 Baidu’s long-term goal is to derive more than half of its revenue outside of China by the year 2020. The company recently made forays into Southeast Asia with a new research office and has also quietly entered Brazil. The company is set to net a significant windfall when its search services are integrated into Apple’s upcoming iOS 6 operating system, in a move that is certain to cost Google a share of Apple’s growing user base in China.